Writer’s note: A glossary for certain key terms can be found at the end of the article. President Trump’s decision to recognize Jerusalem as the capital of Israel will have a seismic impact on Middle Eastern geopolitics and Washington’s role as the mediator in the quest for a Palestine-Israeli peace settlement based on the two-state solution. With his decision, Trump has jettisoned decades of U.S. peacemaking diplomacy in the Arab world and defied the advice of the ‘grown-ups’ in his Administration, reportedly including Defense Secretary James Mattis and Secretary of State Rex Tillerson. The decision, itself, is consistent with the rest of Trump’s foreign-policy directives: high on grandiose symbolism, low on diplomatic competency (i.e. the withdrawal from the Paris Agreement and plans to revoke the Iran Nuclear Deal). The Administration’s decision has set off political convulsions across the Middle East. Trump has gifted Iran’s Ayatollahs and their Hezbollah clients an aura of legitimacy as the champions of the ‘Islamic’ resistance to Israel. He has needlessly empowered the allure of joining violent Islamist radicals from IS to Al-Qaeda, Boko Haram to Lakshar-e-Taiba. He has embarrassed the reformist Saudi Crown Prince Mohammad Bin Salman (MBS) and Egyptian President Abdul Fatteh el-Sisi, both of whom will now be forced to assert their religious claims to Arab Jerusalem, even as their respective regimes struggle against the toxic ideologies of Al-Qaeda and the Muslim Brotherhood. More recently, Trump’s decision has triggered a unanimous backlash from the United Nations; where the rest of the Permanent Five, every non-permanent Security Council member and another 114 countries voted against Trump’s reckless unilateral move. Since the fall of the Soviet Union, political realists have prophesized the “clash of civilizations” and the impending doom of U.S. hegemony in the international order, and now, it seems their claims may soon become a reality. The Palestine-Israeli conflict has long been a simmering political volcano in the region. Since 1948, the State of Israel has fought eight existential wars, confronted two Palestinian intifadas1 and endured a series of armed conflicts across its border. The conflict has been used as the ultimate ‘call of duty’ by pan-Arab dictators, Islamist terrorists, and sectarian theocracies to unite the Arab world, combat perceived ‘Western recolonization’, and ‘reclaim’ the lost Islamic Holy Land. Territorial control of the holy city of Jerusalem has been the heart of the conflict between the Jews and Arabs even before the 1948 creation of Israel during the eras of Ottoman rule and under the British Mandate. Both the Israelis and the Palestinians see the city as their respective nation’s legitimate and even ‘eternal’ capital. Because of the city’s intimate connection to Christianity, Judaism, and Islam, Jerusalem endured a violent and turbulent history of bloody conquest; from the Rashidun-Byzantine War (636CE) to the Crusades (1099CE, 1187CE, 1218CE) and, most recently, the Arab-Israeli conflicts (1948, 1967). Jerusalem holds historical significance as the ancestral/spiritual homeland of the Jewish people, the first direction of prayer for Muslims, and the site of Jesus Christ’s crucifixion and subsequent ascension to heaven. 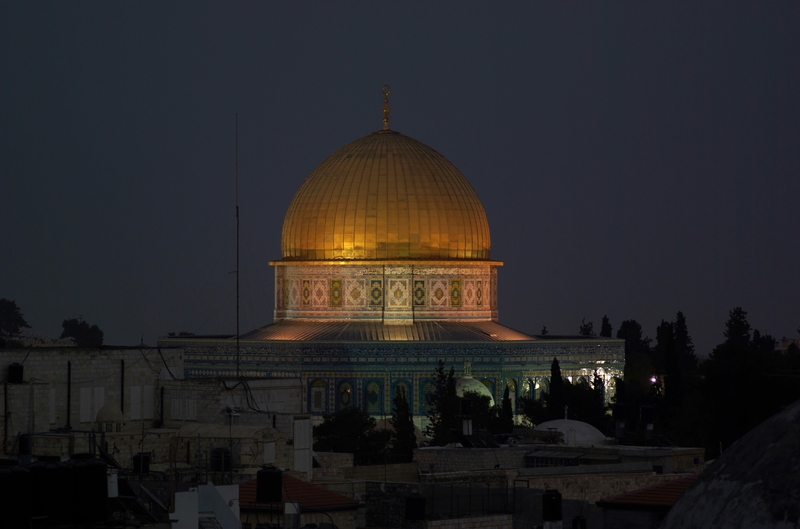 The city also houses holy sites like the Temple Mount, Al-Aqsa Mosque, and the Western Wall – monuments whose ownership is at the center of the Arab-Israeli conflict. 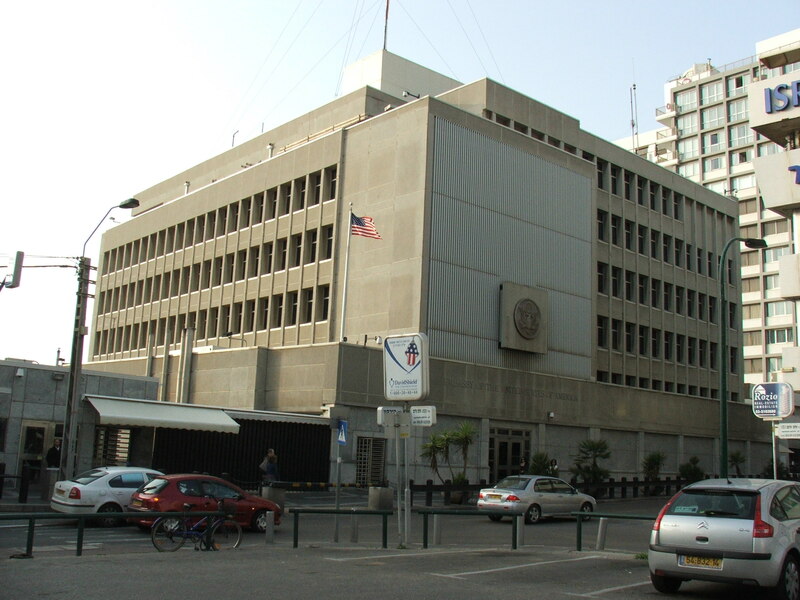 The U.S. Embassy in Tel Aviv, Israel. With the 2017 Jerusalem decision, Donald Trump has ordered the State Department to move the embassy to Jerusalem, with the relocation process expected to take up to four years. Traditionally, the United States has served as the primary mediator between the Palestinians and Israelis. With the 2017 Jerusalem decision, the U.S has officially forfeited its traditional peacekeeping role, striking the final nail in the coffin of decades of American peacekeeping, since the Begin-Sadat talks at Camp David in 1978-79 to the global pacts signed in Oslo and Madrid in the 1990s. Admittedly, President Obama’s 2011 attempt at shuttle diplomacy2 was dead on arrival with Prime Minister Benjamin Netanyahu instinctively rejecting Washington’s 1967 border adjustment proposal. Following these talks, acclaimed political realist Stephen Walt declared that a two-state solution was “further away than ever.” Now, President Mahmoud Abbas has formally declared that Palestine will no longer accept Washington as a sponsor of peace, turning to Europe, Moscow, and Beijing as potential alternatives. In all the wrong ways, Trump has outdone his predecessors on the international stage. It’s no coincidence that Trump’s decision comes fifty years after the 1967 Six Day War. The timing of the Jerusalem decision coincides with a moment of chaos and escalating conflict in the international relations of the Middle East. As outrage against Trump’s decision spreads across the Arab World, regimes and rulers seen as the closest allies of Uncle Sam will pay the heaviest political price. This will be King Salman of Saudi Arabia (and his ruthlessly ambitious Crown Prince MBS) and the military dictator of Egypt, Abdel Fatteh El-Sisi, whose relative silence is assailed by Islamist opponents and armed insurgents. The Kings of Jordan and Morocco, putative descendants of the Prophet Mohammad, also cannot ignore the religious aura that legitimizes their Hashemite and Alaouite dynasties. Trump’s decision triggered widespread protests across the globe. 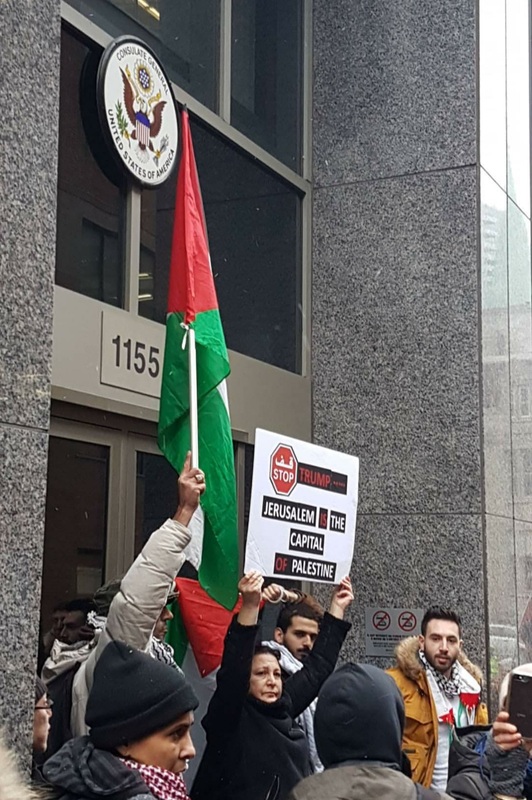 The image above is from the 8th December Montreal Protest where hundreds of demonstrators gathered outside the U.S. consulate general. For a nation that has proclaimed itself as the heart of the Islamic world and where civil society is dictated by Wahhabism, the most conservative and anti-Semitic branch of Sunni Islam, the Kingdom of Saudi Arabia would be expected to be the most vocal critic against Trump’s decision. Saudi Arabia has, for the record, condemned Trump’s decision and has reportedly offered Palestine a new capital; in the form of the tiny village of Abu Dis, located on the outskirts of Jerusalem. Amidst allegations of deliberately reducing domestic press coverage of Trump’s decision and relative inaction when compared to other rival Islamic states (i.e. Iran, Turkey), the Kingdom looks to be taking a backseat in its self-styled role as the champion of Sunni Islam and pan-Arab nationalism. According to Yaakov Nagel, former national security advisor to PM Netanyahu, the Kingdom’s relative silence is a sign of their intent to maintain strong diplomatic ties with Washington rather than furthering a viable two-state settlement. In the midst of Riyadh’s silence, combined with MBS’s radical reform agenda against the Wahhabi establishment, a protracted conflict in Yemen, and a losing cold war with Iran, 2018 looks to be a critical year for the House of Saud’s influence within the Islamic world and stability of its own regime. The Islamic world has unanimously denounced the decision, with policy-makers and international institutions labeling it as a “kiss of death“, “dangerous and unacceptable”, “a death sentence to peace”, and “throwing the region into a ring of fire.” Amidst the choir of condemnation, Iran and Turkey have sprung into action. Both nations have proclaimed East Jerusalem the “eternal” capital of Palestine, spearheaded vigorous Islamic condemnation and are mustering troops to the frontline. Indonesia’s religious establishment has called for an Ummah-wide3 boycott against the United States, and Malaysia has already pledged military support for any future conflict. In 1997, Political scientist Samuel Huntington prophesized the clash of civilizations, and Donald Trump may just prove his point should the conflict ever escalate to total war. 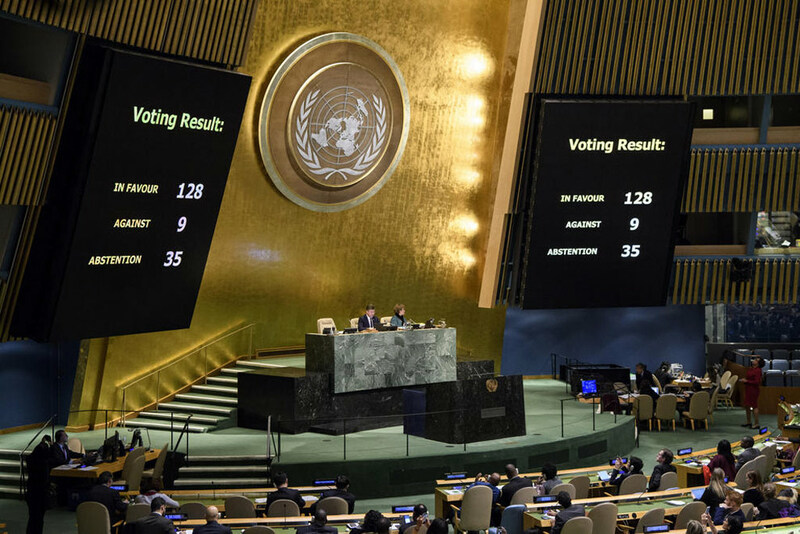 The Jerusalem decision isolates the United States from the international community, as the latest UN General Assembly vote demonstrates, with a 128-9 vote in favour of condemning Washington’s unilateral recognition of Jerusalem as Israel’s capital. Even traditional U.S. allies, like Germany and the United Kingdom, found it politically impossible to abstain on the vote. From the Paris climate talks to Asian trade pacts, to Middle East peacekeeping, it is increasingly evident that the Trump White House has eroded the U.S. claim to global leadership. Trump’s decision on Jerusalem also ignores the basic tenant of international law that does not condone the annexation of territories acquired by military occupation, be it East Jerusalem from Jordan in 1967 or the Crimean Peninsula from Ukraine in 2014. Ironically, even the UN Partition Plan on Palestine in November 1947 recognized Jerusalem as a corpus separatum4 (separated body) to be administered by an international regime. From this perspective, both Israel’s conquest of West Jerusalem in the 1948 war and Hashemite Jordan’s annexation of East Jerusalem in 1950 were illegal. Since 1948, every U.S. administration had recognized that sovereignty over Jerusalem would only be settled in the final stages of a Middle East peace settlement. There is a tangible reason why most Great Powers have maintained embassies in Tel Aviv, not West Jerusalem, for the past seven decades. Now, Trump has unilaterally broken this historic U.S. and global policy consensus and committed an act of premeditated diplomatic vandalism by prejudging a key pillar of a future Palestine-Israeli peace settlement. 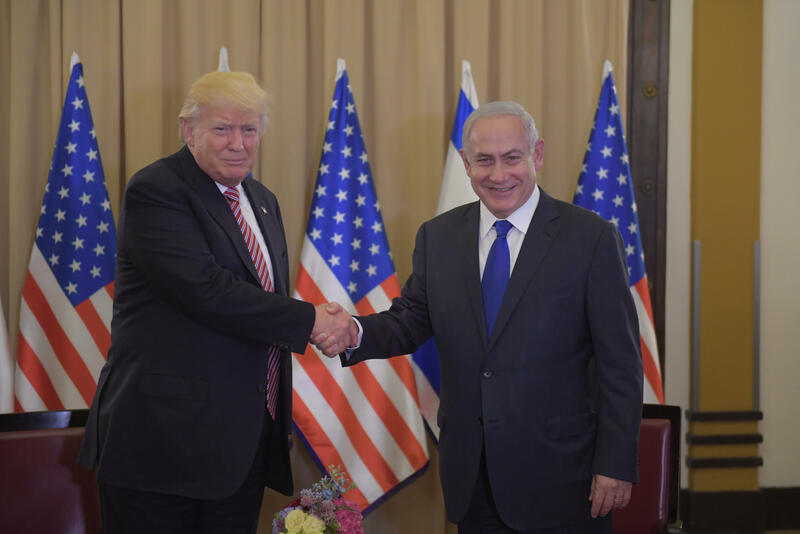 Donald Trump meets with Israeli Prime Minister Benjamin Netanyahu during his first Presidential visit to Israel in May 2017. Has the Two State Solution been killed off? While Trump still clings to the illusion that his son-in-law’s brilliance in the “art of the deal” will lead to a historic Palestine-Israeli peace settlement, his decision on Jerusalem has effectively killed any realistic hope of a two-state solution to the conflict. This is a scenario that fits perfectly with the political objectives of Prime Minister Benjamin Netanyahu and the right-wing Jewish settlers in the West Bank who support his Likud coalition in the Knesset. A one-state solution to the conflict means Israel either becomes an “apartheid state” or one with an Arab majority population, given projected demographics. This is both the negation of the Zionist dream and a formula for endless Jewish-Arab bloodletting, as happened during the Arab Revolt in British Palestine (1936-39) or in the two Palestinian intifadas. The dream of a Palestinian state is the bedrock of modern Palestinian nationalism. There is no way the Palestinian leadership, society, and masses will relinquish the dream of the Return5. Trump has condemned President Abbas, the foremost proponent of a two-state solution, to political impotence (and worse, irrelevance) in front of his own people. Should populist rage mount against the Palestinian Authority, it could very well be the next regime to fall in the post-Arab Spring era. Should a two-state solution remain off the table, Saeb Erekat, the chief PLO negotiator at Oslo and Madrid, has suggested that the Palestinians now focus on “equal rights” and the end to Israeli military occupation in the West Bank. Israel cannot possibly agree to the Palestinians’ demands without destroying its ideological DNA as a Jewish state. Yet, if Israel doesn’t grant millions of occupied Arabs the full vote and Israeli citizenship, it negates its claim to be the only democratic state in the Middle East. As for a potential Beijing or Moscow-sponsored two-state settlement, the chances are slim as the Donnie-Bibi bromance is now far too strong. Any proposition from the Princelings at the Politburo or the Oligarchs in the Kremlin will be met with swift rejection and dismissed as hostile political meddling. So, as Jared Kushner shuttles between Jerusalem and Riyadh to broker “the ultimate deal” on Palestine, the sense of despair and visceral anger amongst the Arab population is mounting. An Administration that is perceived as anti-Islamic by a broad swath of the world’s 1.8 billion Muslims has vindicated their deepest doubts with its impulsive, ill-considered Jerusalem decision. Expect more violence against Jewish settlers in the West Bank. Expect more strident calls by the Arab states to boycott Israel from international forums. Expect more terrorist attacks on Israeli and American soil. For Israel, Trump’s Jerusalem decision will be celebrated as a monumental victory which will usher in a new era in its history. However, for the rest of the Middle East, the 6th of December 2017 will be remembered as a day of infamy. Intifada: The intifadas were two Palestinian uprisings against Israel, the first in the late 1980s and the second in the early 2000s. A series of spontaneous demonstrations, the first intifada was primarily non-violent with demonstrators boycotting Israeli goods and participating in somewhat peaceful protests. The second, which was bloodier, grew out of the collapse of the 2000 peace process. Violent Palestinian militants were left unchecked by the Palestinian Authority and Israeli forces responded with brute force. Shuttle Diplomacy: Negotiations conducted by a mediator who travels between two or more parties that are reluctant to hold direct discussions. Ummah: the whole community of Muslims bound together by ties of religion. Corpus Separatum: Translated from Latin as “separated body”, the term was used to describe the status of the Jerusalem area during the 1947 UN Partition Plan for Palestine. According to the plan, the city would be governed by an international regime, due to the city’s shared religious importance. Palestinian right of return: the political principle held by Palestinian refugees that they have a right to return and a right to property of assets/land left behind by their forebears.